Not far from the famed Woodburn outlet mall on I-5, just south of Portland, can be found a most amazing Victorian treasure box of a house. The Settlemier House, owned and cared for by the non-profit French Prairie Historical Society, is open to the public on a limited basis. Tours can be arranged that will take you through the house’s grand, mostly original interior. Rooms are furnished with period-appropriate furniture, and many of the Settlemier family’s personal household effects are on display as well. The Settlemier House was built in 1892 for Jesse Settlemier and his wife, Eleanor. Jesse’s Oregon family saga began at the age of nine when he came over the Oregon Trail with his parents in 1849. After a brief stint in California, the family came north again, this time laying a land claim on what is now part of the town of Mount Angel, OR. In 1863 the adult Jesse bought a 214-acre tract that would become the highly successful Woodburn Nursery, one of the largest on the West Coast. He and Eleanor initially lived in a log cabin on the property near where the present Settlemier House now stands. The cabin soon was replaced by a modest frame house built in the then-popular “Gothic” style. That house was later moved across the street when the present Settlemier House was built. The small frame house still stands today, and it is one of the very few gothic structures that have survived in Oregon. The present Settlemier House sits on less than an acre of the original nursery land. Jesse Settlemier also founded the town of Woodburn in 1871 and later persuaded the Southern Railroad to build their tracks through his burgeoning town. Jesse lived in the house until he retired in 1911. His son Frank Settlemier then took over the nursery business and lived in the house with his wife, Mabel, until he died in 1951. 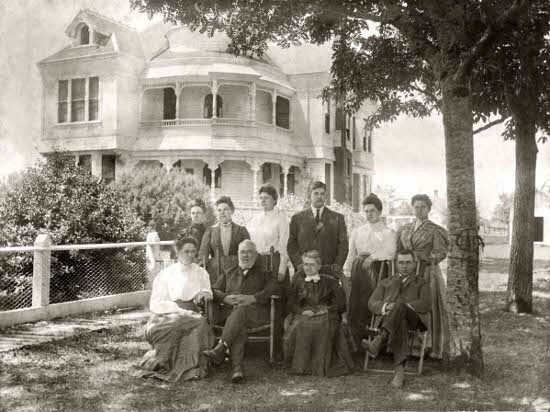 Frank and Mabel added electricity and modern plumbing shortly after they moved in in 1911. They also set out to remodel portions of the interior and to add a drive-through carport (architects call these “porte-cocheres”) and a sleeping porch at the side rear elevation. Circumstantial evidence points to Portland architect William Knighton as the designer of these 1911 improvements. Knighton is known for his design of the Governor Hotel in downtown Portland and many high-end homes in Portland’s West Hills. Today the interior of the house reflects the best of Victorian design (the remaining 1892 house) and that of Craftsman design as well (the 1911 remodel). The 1911 remodel of the dining room and parlor is perhaps the most striking feature of the house’s interior. Its abundant use of stained wood (dark wood at that) and the rooms’ many rustic metal chandeliers and wall sconces put them squarely in the middle of the early twentieth century Arts and Crafts, or Craftsman, style. Other Craftsman features in the dining room include the stained-wood box beam ceilings and the prominent colonnades separating two areas of the dining room. Each massive pillar in the colonnade has an inlaid pattern of contrasting wood. Another Craftsman feature in the rooms is the iridized glass shades on the light fixtures. These were all made by the Quetzal Company of New York City, NY a competitor at the time of the better known Tiffany & Co. Today, you may see Quetzal glass shades popping up on Antiques Roadshow from time to time, usually fetching extraordinary prices. The exterior design of the house is classic Queen Anne with its asymmetrical massing, rounded porch and, of course, witch’s hat turret. The original architect (presently unknown) had quite the knack for skillfully weaving in elements of other styles popular at the time. The left side front elevation has an “Italianate” feel to it — especially with its slanted bay window. Also, we can see the “Stick Style” vertical and horizontal lines on the front façade, hinting at the structural framing beneath. “Eastlake” styling — so popular with furniture in this era — is here represented by the lacy, cut-out fretwork on the upstairs balcony. Even the French “Art Nouveau” played a part in the house’s design. Note the giant clamshell-like leaves that stand in for brackets on the front porch posts. Also, note the swirling Nouveau lines of the cut-out wood trim immediately under the curved front porch window. And last but not least, William Knighton’s 1911 porte-cochere/sleeping porch addition adds a note of Neo-Classical restrained grandeur to the side of the house. Note especially the “Beaux Arts” paired columns on the porte-cochere. Clearly, with all these stylistic influences going on, a less capable architect might have produced a jumbled circus tent house-of-styles instead of the unified, though eclectic, design we see here. Research is ongoing to uncover the identity of this most talented of Oregon Victorian architects. 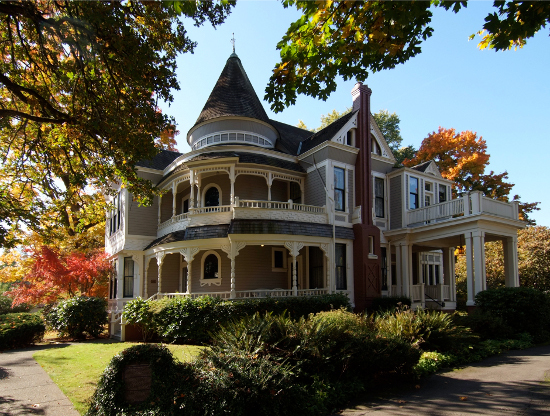 Fine Victorian houses that are open to the public are a rare commodity in Portland. The Settlemier House in Woodburn is well worth the 30-minute drive south from downtown Portland. Next time you go to the outlet mall (or Woodburn’s annual tulip festival in March/April), consider making time to take the tour. It will be worth it. The Settlemier House is open for tours on the first Sunday of each month from 1 pm to 4 pm, or by appointment for groups. This lavishly decorated Victorian is the perfect setting for special occasions such as weddings, holiday parties, family reunions, anniversary parties, business meetings, or family get-togethers.